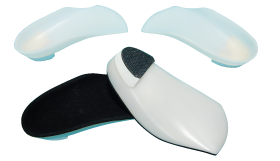 In 1995, Ortho-Dynamics established a custom brace department .Our trained technicians fabricate custom MCI (Maximum Control Inserts), SMO (foot & ankle brace) and MCI (Like) devices for younger patients. All brace and MCI device fabrication is done in our hi-tech production facility by our technicians resulting in the highest quality in our industry today. Activity: Designed to provide maximum biomechanical control for severe pronation and heel valgus with mid-tarsal pronation. Components: High medial and lateral flanges with deep heel cup. Offered in 3mm or 4mm subortholene shell. Extrinsic or intrinsic rear foot posting. Available in met length only. Activity: Activity: Designed to provide maximum biomechanical control for severe pronation, heel valgus with mid-tarsal pronation and supports ankle and frontal plane deformities. 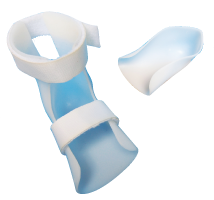 Components: High medial and lateral flanges with deep heel cup and ankle flange. Offered in 3mm or 4mm subortholene shell. Extrinsic or intrinsic rear foot posting. Available in met length only. Billing code L-1907. Components: High medial and lateral flanges with deep heel cup and ankle flange. Offered in 3mm or 4mm subortholene shell. Extrinsic or intrinsic rear foot posting. Available in met length only. Billing code L-1907. Activity: Designed to provide maximum biomechanical control for severe pronation, heel valgus and midtarsal collapse. Components: High medial and lateral flanges with deep heel cup. Offered in 2mm, 3mm or 4mm subortholene shell. Extrinsic or intrinsic rear foot posting. Covered in 1/16 black Spenco. Available in met, sulcus or full length.